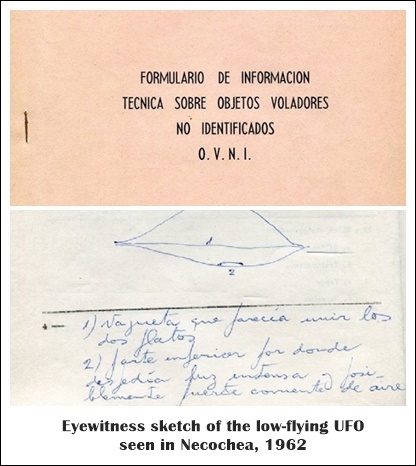 The Argentinean Navy published a series of documents pertaining to a UFO sighting in Necochea in 1962. 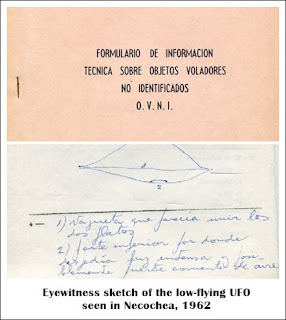 The documents present the eyewitness account of a truck driver pursued by a flying saucer in the vicinity of La Dulce. CEFORA (Commission for the Study of the UFO Phenomenon in the Republic of Argentina) recently published an Argentinean Navy file disclosing the details of an important UFO sighting event that took place in our city some 55 years ago. On August 29, 1962, Osman Alberto Simonini told his story of a UFO encounter in the vicinity of Km 28 of Route 86. Simonini was in his truck, driving out of La Dulce from the "Malabrigo" mink farm, property of Ernesto Arias. 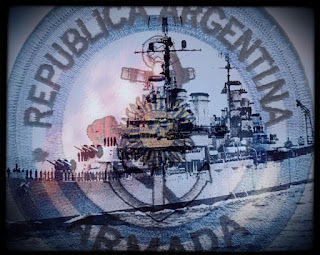 The case become widely known through an article in Ecos Diarios: the Navy commission launched its investigation through Capt. Omar Pagani and the files now form part of the private archive of researcher Roberto Banchs. The incident took place at around 20:10 hours as Simonini drove at slow speed and noticed - to his left and following a parallel trajectory, at a distance of 3 meters and an elevation of 2 meters - an "artifact" resembling two plates linked by their widest sides, the color of gunmetal, having an approximate diameter of 5 meters. The object projected red-and-blue beams similar to headlights from its lower section. The beams had a diameter of two meters, according to the description. Simonini said that the artifact accompanied his truck for some 200 meters. As it did so, the driver noticed that the grass moved as well, proof of its low altitude and some sort of "air or energy" expelled from its lower section. Two minutes later, the object took up at high speed and vanished into the sky. "The officers specializing in these studies told me there was nothing extraordinary about the event, as this kind of phenomenon was already accepted as real, and that the scientific world was waiting for the next stage: making contact with these artifacts." At the time, Guillermo Gimenez (a member of CEFORA [and INEXPLICATA's contributing editor for Argentina]) conducted an exhaustive on-site investigation in the area, after Juan José La Terza got in touch with him. The article can be found at the following link http://www.visionovni.com.ar/archivos/1332 (in Spanish). The documentation contains the report by notary La Terza, who acted as a sort of attorney-in-fact for witness Simonini. Attack of the "Michelin Men"